Iraq's defense minister promised a "house-to-house" search for suspects who planned a suicide car bombing near a recruitment center in Baghdad that killed at least 35 Iraqis hoping to join the military. Meanwhile, U.S. forces clashed with insurgents for a second day northeast of Baghdad on Friday, a U.S. military official said on condition of anonymity. A U.S. Army 1st Infantry patrol came under fire at about 7:45 a.m. in the town of Buhriz, near Baqouba, 35 miles north of Baghdad. Troops returned fire, killing two of the insurgents, said Maj. Neal O'Brien. U.S. helicopters hovered over buildings and cars gutted by fire. Masked gunmen held up rifles and rocket propelled grenades as they danced for the cameras. Women wailed in the streets. In the southern city of Nasiriyah, an explosion overnight wounded four Iraqi police, two seriously, an Italian commander said on condition of anonymity. He had no other details. In Japan, the Cabinet on Friday approved a plan for Japanese troops, now in Iraq on a humanitarian mission, to stay and join a multinational force after Iraq's interim government takes control. U.S. Deputy Defense Secretary Paul Wolfowitz, in Mosul for talks with the Iraqi leadership, promised that American troops would support the new government after the handover because "Iraqi security forces are not ready to assume their job." Authorities said repairs on one of two key oil pipelines damaged in an explosion have been completed, clearing the way for the resumption of exports from Iraq as early as Friday. Exports were halted Wednesday after successive attacks on the two southern pipelines serving as Iraq's main export route. A 250,000 barrel-per-day pipeline that carries crude oil from the oil rich Kirkuk region to Ceyhan, Turkey has been down since attacks late last month. Authorities also said police arrested two men — including a former member of Saddam Hussein's security service — in the assassination of the chief security official in this region's state-run oil company, Ghazi Talabani. Baqouba, a largely Sunni Muslim area that has formed a core of support for Saddam Hussein's former regime, has been the scene of frequent skirmishes between coalition forces and insurgents. Another car bomb exploded Thursday afternoon in a village near Balad, 50 miles north of Baghdad, killed six Iraqi Civil Defense Corps members and wounding four others, the U.S. military said. The defense corps is the main internal security force, created by U.S. administrators to battle insurgents. Defense Minister Hazem al-Shalan promised tough action against those behind the Thursday attacks. 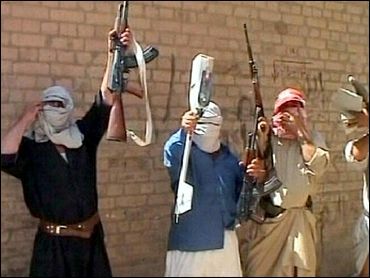 "We will cut off the hands of those people, we will slit their throats if it is necessary to do so," he told reporters. "For those people who want to join the new Iraqi army, we will protect them and we will find them a safe location so they can submit their applications." Asked if the new government would impose martial law if security continues to deteriorate, interim Interior Minister Falah Hassan al-Naqib said: "If we need to do it, yes, we'll do it, we won't hesitate. This is the security of our country ... the security and the life of our people." A decision to impose martial law would be up to the prime minister, al-Shalan said. The explosion near the recruitment center in Baghdad scattered bodies, blood and debris across a four-lane highway. The attack was the deadliest single blast since a car bombing at the same base in February. Most of the victims were poor Iraqis desperate to take dangerous jobs in the Iraqi security forces because of a lack of alternatives in a country with up to 45 percent unemployment. They took their chances at the recruitment center even after the February bombing there killed 47 people. That bombing came a day after a rocket slammed into a U.S. logistics base near Balad, killing three U.S. soldiers and wounding 25 other people, including two civilians. The attacks are part of a surge of violence targeting American troops and their Iraqi allies ahead of the transfer of sovereignty to Iraqis on June 30. The bombings were apparently designed to shake confidence in Iraqi security forces, seen by some in the region as beholden to the Americans. More than 300 people have been killed in attacks on police stations and recruitment centers since September. In the most lethal attacks, five suicide bombings near police stations and a police academy in Basra killed at least 68 and wounded 200.